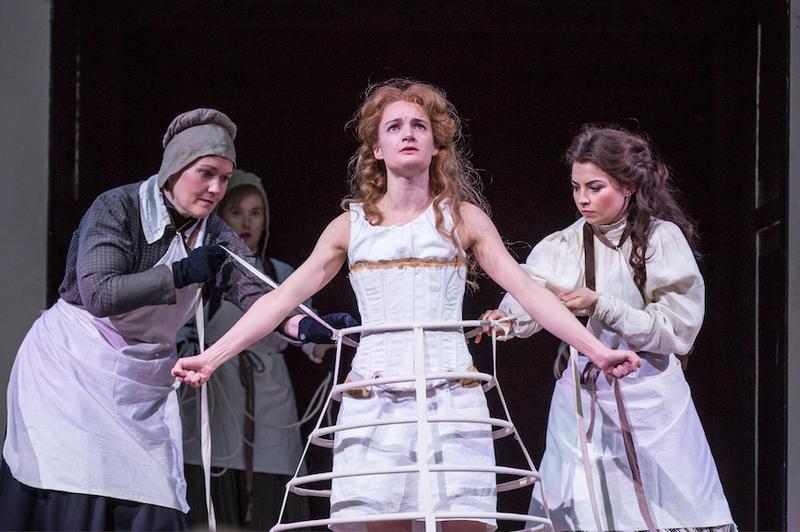 Amy Conroy, Aoife Duffin and Genevieve Hulme-Beaman in The Taming of the Shrew at Shakespeare's Globe. Photo by Marc Brenner. Shakespeare's The Taming of the Shrew is one of his most difficult: watching the breaking of an independent woman by spousal abuse after a forced marriage. The Globe's new production, directed by Caroline Byrne, transports us to 1916 Ireland — and 50% of the roles are performed by women. Byrne challenges the sexism of this complex and controversial play by stressing the harmful oppressiveness of its patriarchal world. The production remembers women's role in the Easter Rising, when a Proclamation was written that included demands for equal status for women in society. These demands have subsequently been ignored, giving a historical context that intensifies the play’s already stark message. This is very much a play of two halves, however, and the power and poignancy of the second act far outweigh the first, which feels a bit frivolous in comparison. The Irish setting is evoked by Irish music; upbeat jigs and dances energise the audience and haunting vocals punctuate poignant scenes. Aoife Duffin, who plays 'shrew' Katherine, sings in a low voice that captures her defiance and her desperation. Duffin’s performance is fearless; her Katherine is initially rough, furious and ready to fight, and her tragic portrayal of a woman being beaten and finally broken in the second act is, at times, difficult to watch. Edward MacLiam as Petruchio is dominating and brutal, his imposing character matching and eventually crushing Duffin’s fierce fight for independence. Byrne’s decision to put onstage what is generally left off — Petruchio’s systematic abuse of his wife — makes her message impossible to ignore. By the end of the play, Kate is an empty shell; starved, still wearing her now tattered and stained wedding dress, and covered in dirt. Duffin delivers Kate’s final speech as the words of a woman destroyed by the society in which she lives, her performance leaving a bitter taste as the jollity of the final jig strikes up awkwardly around her. This is an uncompromising, confrontational production that does not let you forget how unacceptable it is that its themes are still relevant today. The Taming of the Shrew continues at Shakespeare's Globe, Bankside SE1 9DT, until 6 August. Tickets £5-£45. Londonist saw this production on a complimentary ticket.